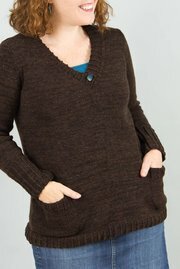 Cider Mill is the kind of sweater I wear all winter in my studio. I keep things chilly enough that I need a substantial sweater from about October through March. When I have a choice, I reach for something that's comfortable enough to snug up in for an entire day - and stylish enough to look great in a video call. 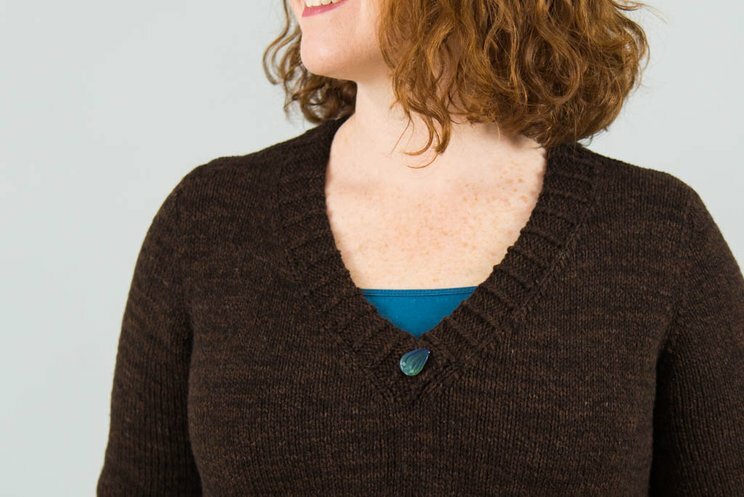 Cider Mill has slipped into my wardrobe perfectly: The long length, A-line shape, and bonus pockets are as cozy as it gets; at the same time, the unusual wide twisted rib and artisan glass buttons are clean and modern. 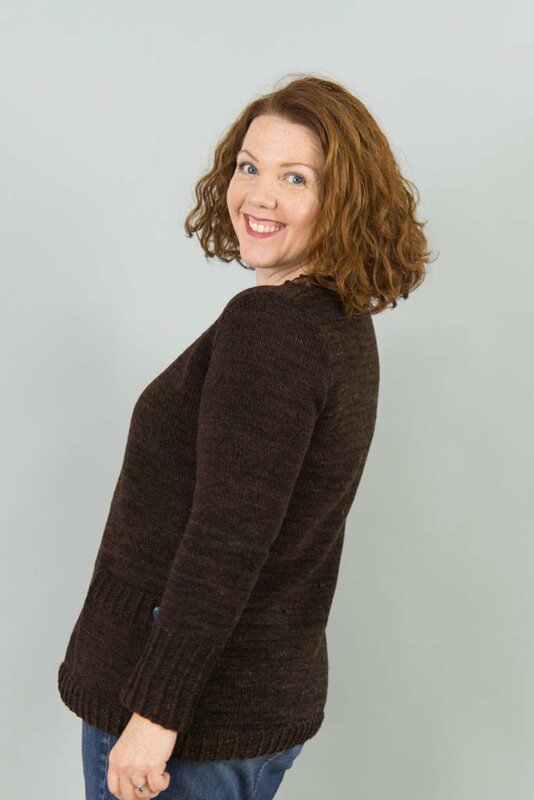 The yarn, thoughtfully and locally made by Jill Draper, is utterly amazing: It's 100% cormo-merino crossbreed that feels as good as it looks. 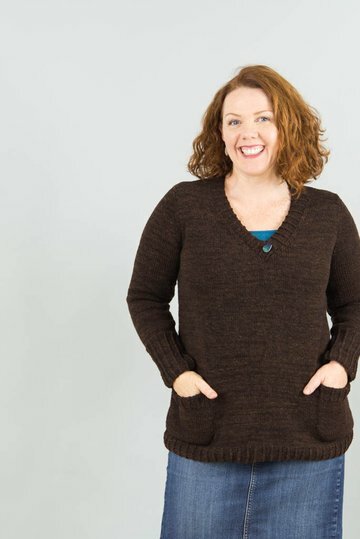 Cider Mill is shown in Jill Draper Makes Stuff Rockwell, a 100% cormo-merino crossbred wool that's made, from sheep to skein, in the Northeast. It would take someone with better words than I have to describe how amazing this yarn is. It's warm and rustic, but so soft you could weep. The marled colors are exquisite, and work perfectly with Cider Mill's clean lines. 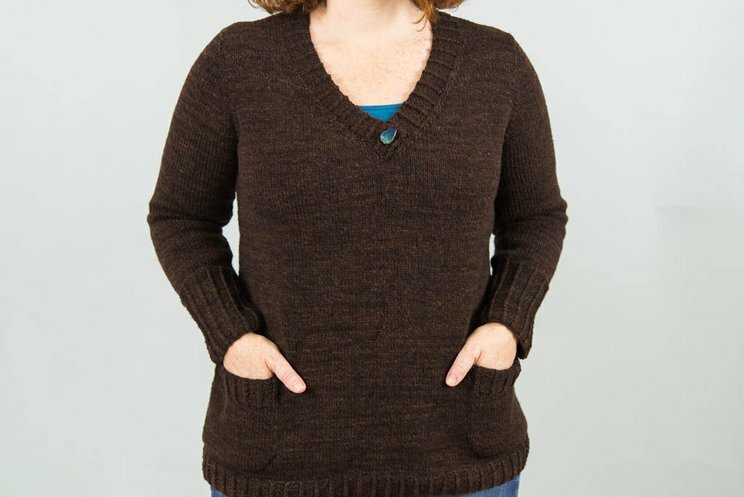 Wearing a sweater out of this yarn simultaneously transports me to my favorite fall fiber festival, and makes me feel like I'm getting a giant hug all day long. I used the color "Dark Roast", and liked the yarn at a gauge of 20 stitches and 28 rows to 4'' (10 cm). If you're getting roughly the same gauge that I am, for a standard size 30 (32, 34, 36, 38, 40, 42, 46, 50, 54, 58, 62)'' bust you'll need approximately 5 (5, 5, 5, 6, 6, 6, 7, 8, 8, 9, 10) hanks of Rockwell.